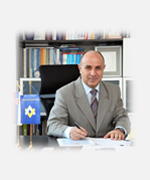 :: University of Illinois at Chicago, Department CEMM, 1985-1987, USA Research assistant and graduate student (advisor prof. Dusan Krajcinovic). Research in Damage Mechanics. :: Prize of the Assembly of the City of Belgrade for research: "20 October", (with Prof D. Krajcinovic) for the book "Elements of Fracture Mechanics",1990.
:: Prize of the Chamber of the City of Belgrade (for Master's deg. work), 1984.
:: D. Sumarac, D. Krajcinovic, Elements of Fracture Mechanics, (InSerbian) Naucna knjiga, Beograd, 1990.
:: For PhD degree (two students): Lenart Djerdj 1996., Ljudmila Kudrjavceva 2007.
:: 103 publicatiouns, more than 40 in International jorurnals. :: More than 254 citations (SCI Index) within the period 1988-2009.
:: Engaged in the design of concrete and steel structures in Serbia, Russia, Irak, Algeria.